* At the resize, disk allocation step it should be clearly visible existing & new installation, their disk names and sizes. A clear resize area should be visible which should be possible to drag left & right. * Bug #1240532, fix for which is also included in the update. Make sure you do complete the dual-boot installation. 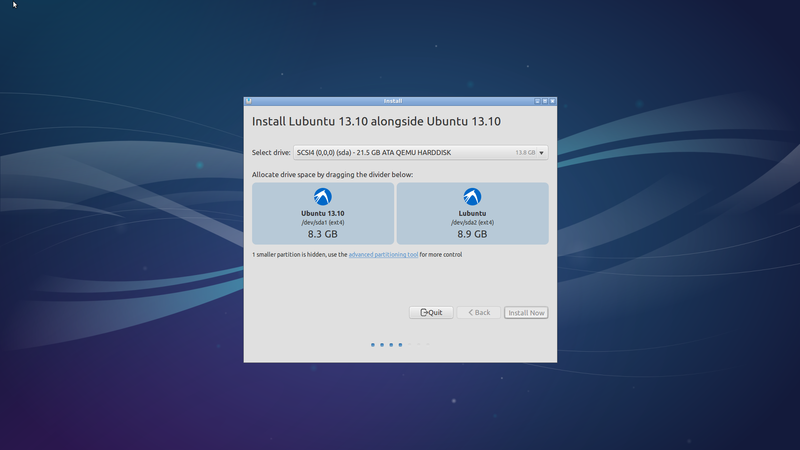 I clicked through the 12.04 LTS Beta 1 installation wizard and selected "Install 12.04 LTS alongside 11.10". 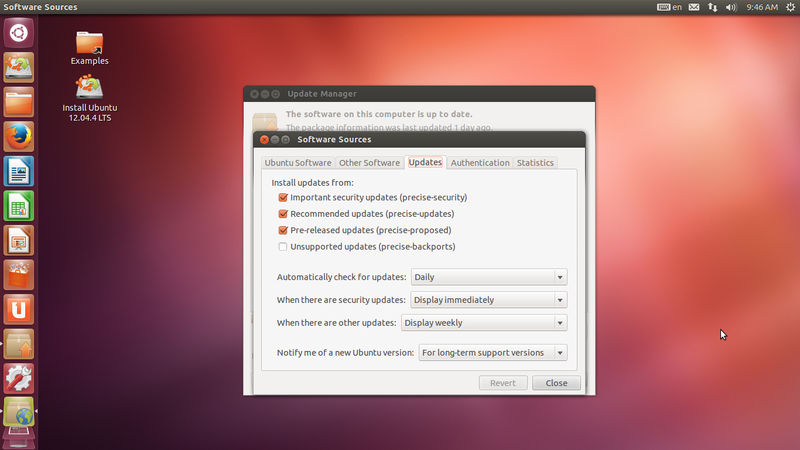 I am presented with a simple slider to manage the partitions for the existing and new version of Ubuntu. However, the only labels present on the partitions are the sizes (approx 240GB and 60GB). Which one is for 12.04 and which for 11.10? <http://goo.gl/bM1JH>: "Each operating system item should contain a description that has the name and version of the operating system (as obtained from os-prober), and the block device or partition label, filesystem type, and size..."
A screenshot would still be helpful here. Was this a design decision or accident? Setting to wish list makes me think it was done on purpose. I think this is a usability bug, hindering users' attaining information about and configuring their installation. 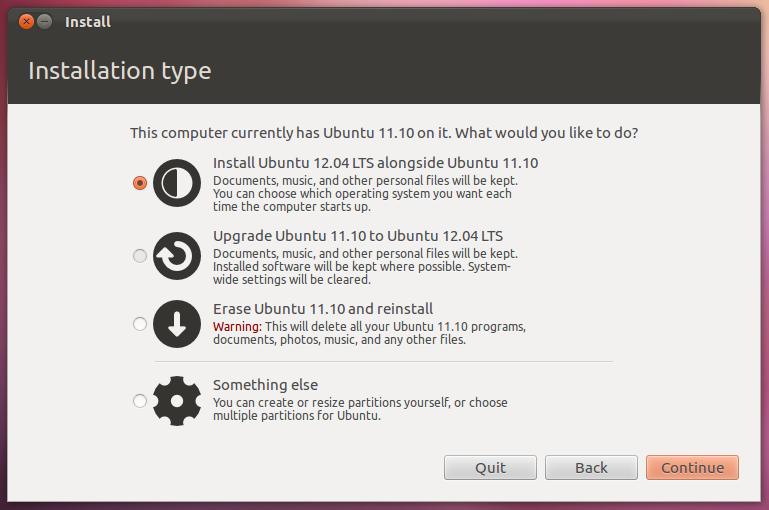 Hm... there should be Ubuntu Circle of Friends logos on both sides, and a label. At least that's what happens on full disk install, for example. Happened to me, only I was installing alongside Windows 7. This is a real show stopper if you want uneven partitions. Also I was using 12.04 (not beta) 64bit, and it was Win 7 64 bit. This happened to me as well, installing 64 bit 12.04 alongside Windows 7 64. There is a duplicate of this bug where it is mentioned that if you drag the window off screen, the Ubuntu logo will show up where it should be. I confirmed this myself earlier this morning. So the images are where they should be, but for whatever reason are not being displayed properly unless they are first dragged off screen. I should also probably note that I have a Lenovo Ideapad Y570, with both the onboard Intel graphics as well as the nvidia graphics card. I assume that the installer would be using the Intel graphics? If anyone comes here looking for a quick answer: Your current installation should be on the left (the beginning of your disk), while the new install will be the right hand side (the end of your disk). I did some more investigation on this bug. In the minimal example the logo and labels are painted, but the z-order is wrong such that the dotted pattern wipes them. Strangely enough the "use_disk" mode (when multiple disks are present), shows the logo & that the titles correctly. still have this issue on the latest raring 13.04 beta image. This causes a lot of confusion during installation. Its silly if in the middle of an install one has to search the internet to try and figure this out! The average person will not waste their time and will just goto some other distro or just stick to windows! Thanks alex! This just happened to me while installing Elementary OS. Should we just wait until the change hits the 12.04.4 dailys or would it be OK to "update" and then "install" ubiquity to grab the updated version? @Stéphane - I'm also not sure how to proceed. Would it be valid to: get the new package on my system, use Startup Disk Creator to create an ISO/USB installer, test with that installer (either on my live machine or a VM)? Or better to just use the daily ISO as Erick suggested? I'm gaining, it took me a while to adjust to the fact that "proposed" is enabled by default in the 12.04.4 20140123 i386 image. It does appear to be fixed but I want to document the whole process to make sure it makes sense to Stéphane. Arrgh, ubiquity crashed, please see bug #1272272. That updated version does work OK with "something else"/ aka manual partitioning but I was surprised to see that it defaulted to "do not use this partition" w/o a reboot. After ubiguity crashed I reported bug #1272272. When I was done reporting that bug I restarted ubiquity w/o rebooting and chose "something else". Once I selected the partition that had been created during the auto-resize process and clicked on change I noticed that the default was "do not use this partition" which I think is odd. Or is it? Unfortunately I do not get a side-by-side option on the machines I have access to (laptop already dual-booting, and VM is acting up :P ), so I can't confirm this on my side. 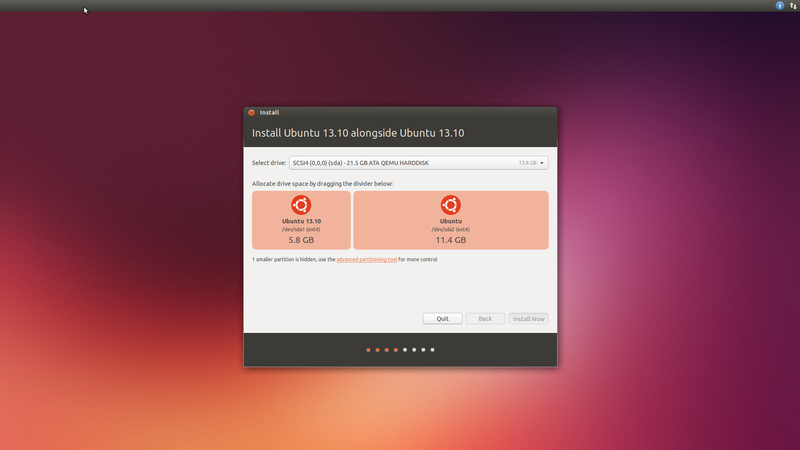 One query: in the screenshots I have seen so far, the existing partition is always fully labelled ("Ubuntu 13.10") but to-be-installed partition is always called just "Ubuntu" (rather than "Ubuntu 12.04.4 LTS"). Is this intential? > can't confirm this on my side. to fix declared bug reports. in an improvements and didn't regress below the baseline. bug reports using "ubuntu-bug ubiquity". Even though ubiquity 2.10.29 landed in the Precise 20140124 images I was still unable to give this a verification-done status because of bug #1051935, but the python-apt and python-apt-common updates landed in the 20140125 i386 image so I can now almost safely change the status to verification-done. I even tested the "slider" but I did overlook bug #1240532 so I need to rinse-n-repeat to be sure there was no regression related to the "back button" ..... clearly the install button worked properly because the installation completed successfully. So I need to perform one last test being certain that the back button works OK ............. shouldn't be long. In an overabundance of caution I tested the link to the "advanced partitioning tool" as well as the quit button and all is well so I'm marking this verification-done. I'll really appreciate this the next time I need to install a dual-boot. Thanks everyone involved!